Enjoying the beer garden on a sunny evening. Purple Moose - Snowdonia Ale (Cwrw Eryri) 3.60 Well served. Waited for five minutes for service. None came so we moved on. Mid-afternoon and the pub has just a couple of other customers. It is a real time-warp – like a 1970s theme bar. Purple Moose - Snowdonia Ale (Cwrw Eryri) 3.60 Golden, malty and nice. Thwaites - Wainwright (please now use the Banks's entry) 4.10 Well balanced, hoppy golden ale. Friendly locals pub. Big fuss made of the dog. Purple Moose - Snowdonia Ale (Cwrw Eryri) 3.60 As good as this beer will now get. Fresh, malty with that slightly honeyed feel. Not a patch on earlier versions though. Thwaites - Lancaster Bomber (please now use the Banks's entry) 4.40 Not Tried Just went off. Brains - Hancock's HB 3.60 Not Tried Just came on. Brand owned by Coors and, I think, brewed by Brains. Super friendly pub where, although Welsh is very much the first language, all are made to feel welcome. Purple Moose - Snowdonia Ale (Cwrw Eryri) 3.60 Much better but I suspect the recipe has changed. Sweeter with broad hints of crystal malt. Not quite so hoppy but still eminently drinkable. Purple Moose - Snowdonia Ale (Cwrw Eryri) 3.60 Last of the cask. Willingly changed though. Quiet for a sunny lunchtime visit. Purple Moose - Snowdonia Ale (Cwrw Eryri) 3.60 Well balanced, high quality golden. Refreshing citrus hops and long satisfying finish. 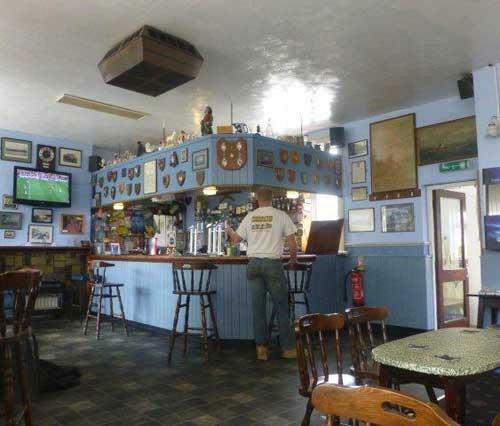 The pub is found in Porthmadog, Gwynedd, LL49 9HT. Comfortable public bar at Porthmadog mainline railway station. Usually two or three ales mostly from local micros. Friendly staff and customers. We have visited this pub 7 times, seen 9 different beers and tried 2 of them.